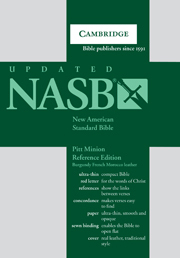 A brand new edition of the renowned New American Standard Bible, reflecting the best traditions of Cambridge Bible typography and production values. Cambridge's original Pitt Minion Bibleswere notable for their use of a compact typeface designed for Cambridge University Press in the heyday of hot-metal composition. They have been a feature of the Cambridge list for over half a century. The NASB Pitt Minion Reference Edition now follows in this historic tradition, using a stylish modern digital typeface which like its predecessor combines utility and elegance. 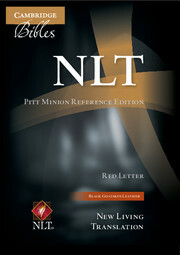 It uses the Lexicon typeface, carefully chosen for its economical use of space. This is the font used for dictionaries and encyclopaedias because it accommodates a lot of characters in a small space. 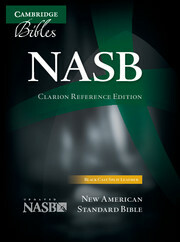 The result is a classic Bible for the twenty first century produced in a remarkably compact yet readable form. 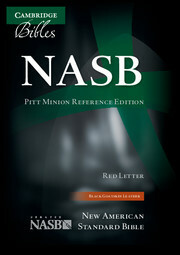 Cambridge's NASB Pitt Minion Bibles feature red-letter text for the words of Christ and full cross-references. Printed on India paper, the pages are sewn for maximum resilience and durability. 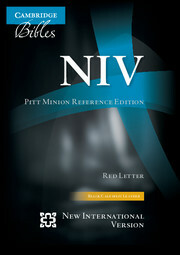 This Bible has a ribbon to keep the place and a presentation page. Extra study features include a concordance and 16 pages of maps.